I’ve always loved fairies! So much so that I’ve been making my own fairy houses for my house and garden. Mostly they are of stone, which I stack and glue and grout, a painstaking process that takes weeks. Of course a house needs doors, even a fairy house, and the doors are a bit quicker to make, thus providing more immediate gratification. 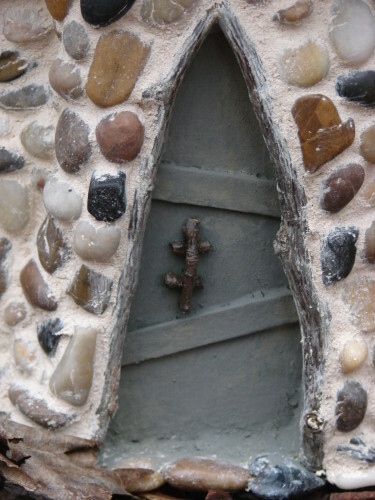 In this tutorial, I’ll share some of the techniques I’ve learned to make charming, whimsical fairy house doors. 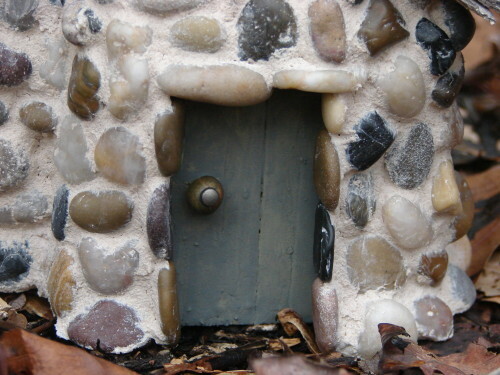 There are many types of doors for fairy houses: whimsical free-shaped doors with pointy tops, rectangular wooden slat doors, clay doors made from molds and hobbit-type round doors. Your imagination and your at-hand supplies are the only limit to what you can create. 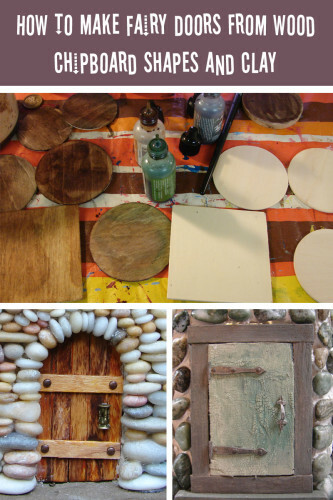 Here I’ll share some of the ways I make fairy doors. One of the easiest ways to make a fairy door is from a wooden chipboard shape. 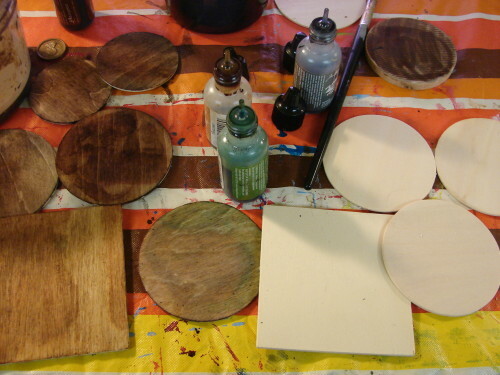 You can buy chipboard circles, rectangles, and squares quite inexpensively at craft stores. 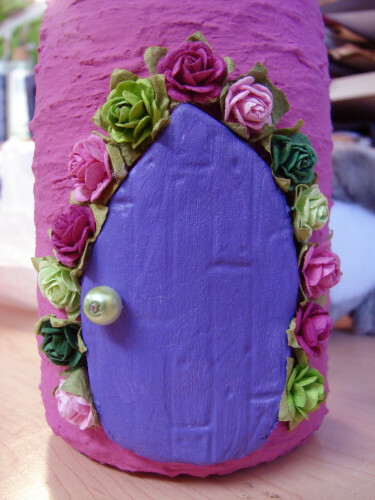 Simply paint them your preferred color, add a bead or button for a door handle and glue to your fairy house. Easy! Here is a completed door I made using this method. I added dollhouse hinges and a door handle I purchased online and cut a frame from square dowels from the hardware store. These two doors are from my Pinecone Fairy Cottage. They both use the same wood slab technique for the doors. The top one is the front door. It uses twigs for a door frame and twigs for the door handle. The back door is more simple, as fitting. I used a wood bead with a jewelry pin as the door handle. I carved vertical lines into the wood slab to create the feel of planks of wood. Another easy construction technique is to use wooden popsicle sticks or square dowels glued together in strips to form a door. Cut the wood into the size you want. Glue together with tacky glue, wood glue, or any white school glue. Add cross pieces for architectural interest in front and stability in back, as needed. Stain or paint. 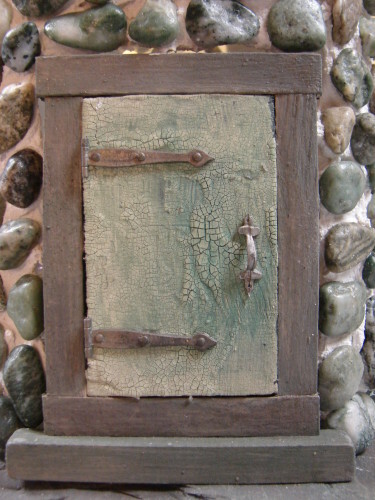 Add beads, jewelry findings, or twigs for a door handle. Seal with a varnish if desired and glue in place on your fairy house. Here’s a door I made using this method. 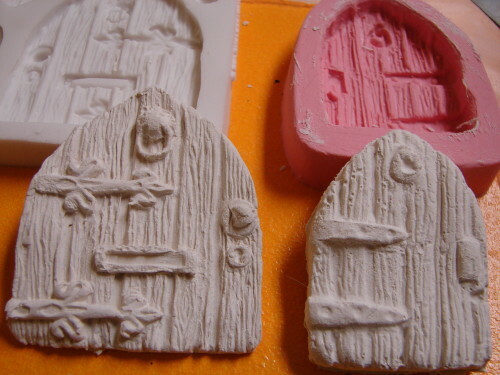 Another quick and easy way to make a fairy house door is to use a mold. Molds are widely available on Etsy; I’ve purchased a number of them, in a variety of sizes. Molds are super easy to use – just mash the clay into the mold, pull it off and let it dry, cure or bake and you’re done! Okay, so maybe there’s a bit more to it than that. First you need to choose your clay: do you want to use polymer clay which must be baked; paper clay that air dries; or epoxy clay that cures in a few hours? No clue? Then I suggest you start with an air dry clay like Creative PaperClay or Crayola Air-Dry Clay, both of which can be purchased at a craft store. Air dry clays are non-toxic, kid-friendly, paintable and easy to use. The hardest part is peeling it off the mold and waiting for it to dry. Below are some doors I made from paper clay. 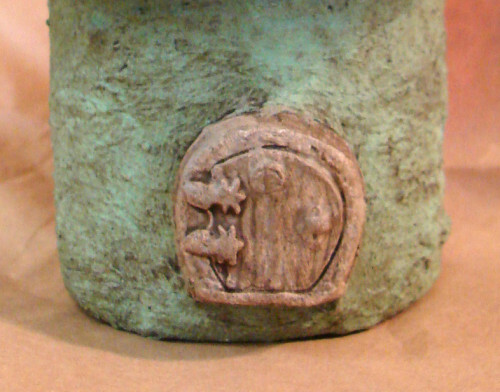 This first one is a tiny little door, about 1″ high, that I applied to a mushroom fairy house. I gave it a wash of sepia brown paint to age it. The second one is bigger, about 3 1/4″ high, and I didn’t use a mold for it, but just rolled out the paper clay and cut a fairy door shape out of it. It was kind of plain so I impressed the top with a wood plank pattern plastic mold that I had. Since I was putting this door on a bottle, which has a rounded shape, I made sure to press the door onto the bottle to round the sides before I let it dry. After drying I glued it on with E-6000, my favorite glue. You could also use tacky glue or white glue. The door handle is made from a green pearl with a head pin and is also glued on. Once applied, the door looked a tad boring so I glued paper flowers around it as a frame. I think it came out great! 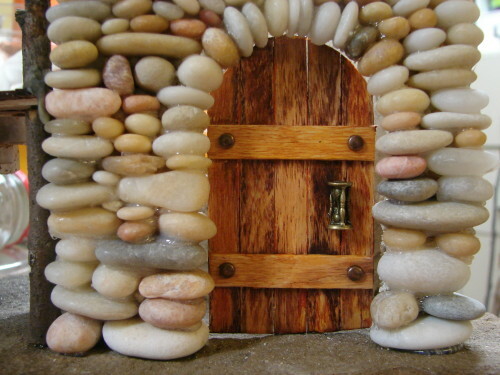 Until I have time to make my own video tutorials on creating your own fairy house doors, I’m sharing some of the best ones I’ve found around the web.